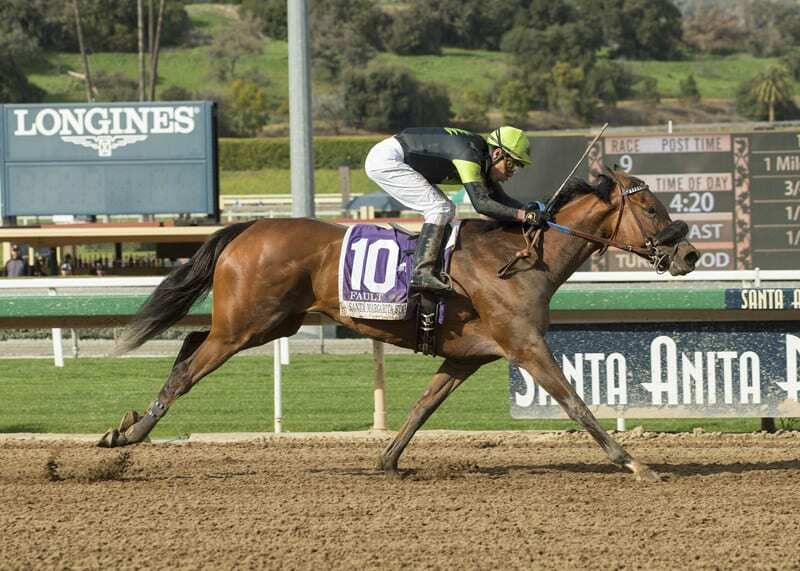 ARCADIA, CA – Agave Racing Stable and Little Red Feather Racing’s Fault proved to be much the best once again, winning her second straight Santa Anita start, this time over the dirt, in Saturday’s Grade 1, $400,000 Santa Margarita Stakes. Breaking from the far outside in post 10 under Geovanni Franco, Fault fanned five-wide into the first turn initially before settling off the pace so that she could angle in towards the rail. Meanwhile, Mended and Turkish Tabby dueled closely up front while posting fractions of :22.92, :46.79, and 1:11.11. Heading into the far turn, Fault again bid five-wide while closing in quickly on the lead pair. Hitting the top of the stretch in full stride, Fault kicked away clear to win by 6 1/2 lengths ina final time of 1:50.58 for the 9-furlong main track event. Mended held on well for second by 2 1/4 lengths ahead of the favored Mopotism, with only a nose clearing her past La Force at the wire for third. Majestic Heat, Turkish Tabby, Dalsaros, Eccentric Spinster, Mistressofthenight, and Bishop’s Pond completed the order of finish. Fault’s win was her first over the southern California dirt after taking the Grade 2 Buena Vista Stakes on turf last month. The 4-year-old daughter of Blame improved her record to 15-5-3-2 with career earnings of $558,795. Fault returned $9 to win, $5.60 to place, and $3.40 to show. Mended brought back $7.80 to place and $3.60 to show, while Mopotism paid $2.40 to show.